Runs fine here in Sierra, supposedly in 64-bit mode. 2. It apparently uses the patched SDL that corrects the cursor shadow in High Sierra (which also improves the appearance of the cursor in Sierra, and probably earlier). 4. I think someone with more expertise should have a look at the fix for the color issue. The fact that it works does not necessarily indicate that it is proper coding. For instance, with SDL_APPACTIVE removed, it is not at all clear what kind of activation event this is about, window, mouse, focus, or whatever, "gain" for what? The merged code is here. However, SDL2 version seems to be on the way. Before building, put SDL2.framework to /Library/Frameworks. I hope that it shows only a 64-bit architecture in the file (and says it's a non-fat file). I'll delete the version linked in the earlier post. 1. For non-Japanese speakers, the download link is at the bottom of the page. The download takes a long time before it begins. You may get better results in Firefox or Chrome than in Safari. 2. I have SDL2.framework in /Library/Frameworks (which is where the project looks for it). But I was unable to make a working build. The Frameworks folder was not built into the bundle; I tried adding that folder manually, but it did not help. When I launched the unix binary from the command line, it told me that it could not open the ROM file. Someone more expert than me may be able to build this. It seems you have also deleted your last build? My mistake! It's back now (I hope). Thanks for catching this. And, on another subject, the suggested fix for the color palette problem is now part of the official code (the second version of the fix). Thanks for staying on track of this! I´m getting a stack/heap collision (again) with 7.6 - is it only me? I get the same thing with 7.5.3. You might want to experiment with settings. 8.1 and later seem to work well. But I've tried only 8.1, 8.6, and 9.0.4. EDIT: I mistakenly suggested filing a report on GitHub, but, as Ronald points out, the problem seems to be limited to kanjitalk755's code; it's not a problem in the 32-bit official code. Last edited by emendelson on Sat Dec 02, 2017 9:25 pm, edited 1 time in total. And I am getting this with 7.5.5. This issue seems related to the builds from the code by kanjitalk755. Also when I force yesterdays 'fat' build to run in 32-bit mode, 7.5.5 startup stops with this error. A regular 32-bit build from current cebix-macemu code with the same fixes for cursor (SDL patch), Ctrl-F5, and "color palette" does not show this issue. Last edited by Ronald P. Regensburg on Sat Dec 02, 2017 9:05 pm, edited 2 times in total. Can't you run it directly from Xcode? Unfortunately, I can't reproduce the problem. I have prepared issue page on GitHub. Please write down the issues specific to this project. Yes! It runs directly from Xcode! I was trying to run it by launching it directly the Derived Data folder, after adding a Mac OS ROM file. It won't run when I double-click the app bundle, but it does run from Xcode. Thank you! I have fixed stack/heap collision with system7.x. And I copied sdl_video.cpp from cebix/macemu. Yes, the stack/heap collision is now fixed. There also appears to be a white screen and lost mouse cursor issue after toggling full-screen (Ctrl-return) with System 7.x (not with MacOS 8/9). But that issue also exists in builds from current cebix/macemu source. Thanks a bunch for the SheepShaver.dmg! Your build does what it should on my side and its fast too. 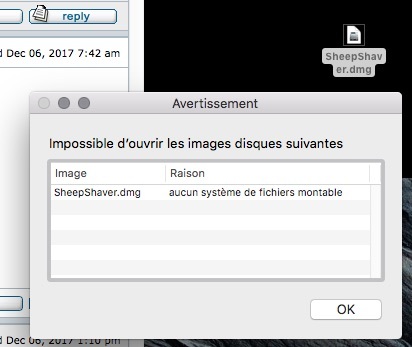 It looks like SheepShaver and BII may indeed survive into 10.14! That's something I didn't think I'd see 4 years ago (as is evidenced from my comments in this forum). As an interim solution, I posted my 2014 build with the patched SDL framework by kanjitalk755 that will solve the cosmetic mouse cursor issue in High Sierra. Kanjitalk755's 64-bit build is very impressive. I've noticed one problem: any attempt to access the Internet (via Classilla) causes it to crash. I hope this won't be difficult to fix. I copied 64-bit clean slirp library from https://github.com/jvernet/macemu. Please pull from my repo, build and test. If it's OK, I'll release the build. Good work, slirp works with your latest code. The build seems really fast. Excellent work! Thank you again! DiskImageMounter cries "no mountable file system". Disk Utility doesn’t want to mount it either. Mac OS X 10.11.6 here. 64-bit clean slirp version is now released. New dmg is HFS+, mountable on El Capitan. Was AFPS, works fine now , thanks. I noticed a change in recent builds in Sierra. The default "/dev/poll/cdrom" setting for cdrom (that does not work anymore since OSX 10.8) now appears as a volume in the volumes list in SheepShaver preferences (the built-in prefs editor) and CDROM checkboxes appear after the volumes in the list. Is this a change that is supposed to enable mounting CD-ROM's? If so, how am I supposed to use it? I can answer part of my questions myself. When the CDROM checkbox is checked for a volume, it will be mounted as a locked disk with CD icon in SheepShaver, also locked if the disk image file is not locked itself. I have not checked if software, like some games, will also see the CD-image as the original image. If so, that would be pretty neat. But showing the non-functional cdrom setting with its default "/dev/poll/cdrom" in the volumes list is confusing.